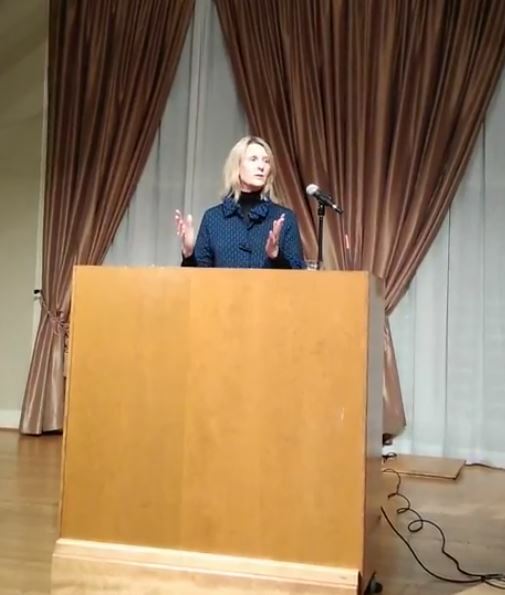 Friday evening in Kirkland, State Senator Patty Kuderer spoke about the establishment of a state bank for Washington State. Last year, Governor Inslee signed a budget that included $480,000 to develop a proposal for the creation of a public cooperative bank. Professional bankers and economists are in the process of working out details of how the state bank should work. Once the proposal is presented to the legislature, in June of this year, work can begin on concrete legislation to create a public bank. Said legislation is likely to be filed in 2020. A state bank would save taxpayers millions of dollars a year: instead of paying interest and fees to private banks, the state bank would accept deposits and lend out money. King County, for example, sits on over $5 billion in reserves. Perhaps marijuana tax revenues could be placed in such a state bank. That would depend on resolution of federal laws outlawing marijuana. Washington State would create a state bank, but it wouldn’t run it. Professionals would do that. The Public Works Assistance Account is a model in Washington State for how a state bank can succeed. It’s had a zero default rate over 40 years. Kuderer said that lobbyists from Wall Street banks (Wells Fargo, etc) flooded Olympia last year, and it was only with great effort that the provision of the $480,000 was able to be signed into law. State credit unions were neutral about the state bank in 2018. But their head lobbyist was “harassed out of a job” and recently the credit unions too have been opposing a state bank. She is sure that lobbyists will continue to oppose the state bank, often in devious, “stealthy” ways. Here’s an article by the Public Banking Institute on Washington State’s efforts to create a state bank. Senator Kuderer suggests we contact Davidson and ask him to support the bank. Banks have a bad reputation.They came crying to Uncle Same for bailouts after they had crashed the economy. They engaged in massive fraud, for which nobody went to jail. So, the people should support a state bank. Moreover, a state bank would save the taxpayers money. Even Republicans should like that. Aside from Senator Kuderer, Senator Bob Hasegawa and Senator Lisa Wellman have been playing leading roles in support of a state bank. On another matter, Kuderer also said that constituents of Senator Steve Hobbs and Senator Guy Palumbo should contact them and — politely — ask them to support the capital gains tax that would help fix Washington State’s regressive tax system (the most regressive in the nation). Those two senators, along with Senators Mullet and Takko have been leaning against support of the capital gains tax, which is a high priority for Democrats and progressives. See this article.